If your primary reason for traveling to Africa is to experience an abundance of African wildlife in unspoiled wilderness, Tanzania should be your destination of choice. In this itinerary, enjoy the services of your private, world-class safari guide who will lead you to the most exciting wildlife moments the African continent has to offer. 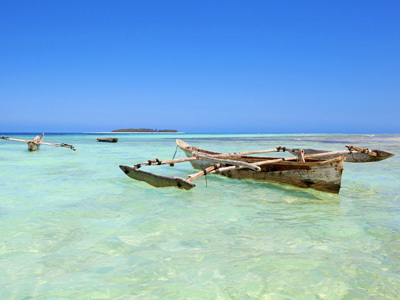 Then land in Zanzibar, where a boutique beach resort is waiting to rest your spirit before your return home. Welcome to Tanzania! On arrival at the Kilimanjaro International Airport you will proceed through customs and immigration (Visa on Arrival Fee: $100 USD per person - payable in US dollars - Cash). After clearing customs you will be met in the arrivals hall by our local representative (he will be holding a sign with your name on it) and transferred to your accommodations in Arusha (approximately 1 hour driving distance). Enjoy a leisurely morning, then transfer to Arusha National Park for an introductory game drive. Today you will enjoy a guided canoe trip on Lake Momella. In the north east part of Arusha National Park, lies the area known as the Momella Lakes. Fringed by green hills, seven lakes nestle in valleys and depressions, punctuating the post-volcanic landscape. Their sodium rich contents and the formation of algae, make the lakes alkaline, especially the big Momella Lake and Lake Reshateni - therefore all year round they are a favorable feeding and resting areas for flamingos. Have your camera ready throughout the tour, for many beautiful photo opportunities. 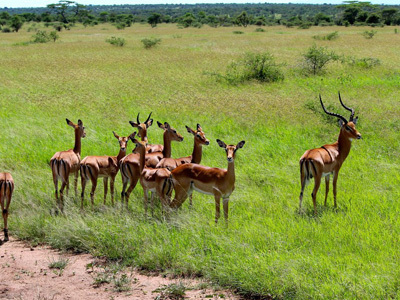 Enjoy a full day of game driving in the Tarangire National Park. With endless species roaming the area, it shouldn't be hard for your expert guide to lead you towards the action. Whether you encounter an entire herd, or a lone traveler, the thrill of observing the wildlife in their natural habitat is magical. Embrace each sighting and enjoy it to the fullest...you never know what the day may have in store for you! 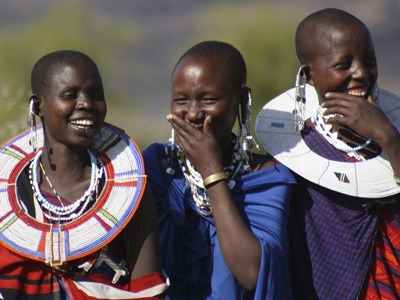 Today, you will transfer into the Maasai Heartlands for a unique cultural experience. You will head into a village called Esilalei (Toothbrush Tree). 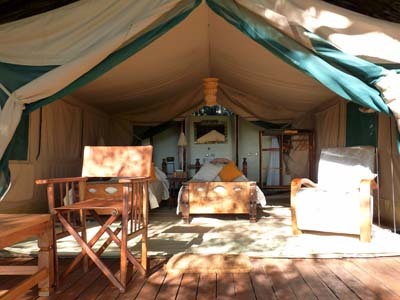 This rural village is located in the wildlife corridor in between Tarangire and Lake Manyara. As you enter the village, you will be greeted by the village elders, children and Morani warriors. Your visit supports the building of their school here, which you will have the opportunity to visit. 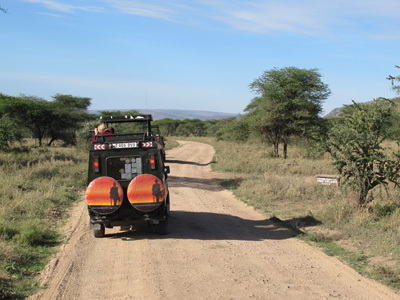 Later this afternoon, you will game drive to Lake Manyara National Park. Enjoy a night time game drive tonight. 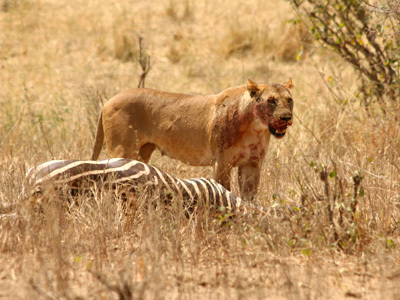 Lake Manyara National Park possesses an unexpectedly striking setting and peaceful surroundings. Dramatically bordered by the wall of the Rift Valley on one side and the shores of the lake on the other, this thin stretch of land contains diverse habitats that host a remarkable variety of wildlife. The open grasslands between the lake and the acacia woodland are littered with wildebeest, zebra, impala and giraffe, as well as the country’s densest population of buffalo. If one is looking for the great taste of Tanzanian Culture, Mto wa Mbu Village is the optimal choice. Here, you'll find a melting pot of cultures from different corners of the country as there are inhabitants from 120 different tribes. Mto wa Mbu flourishes in the presence of three great rivers namely, Kirurumu river, Mahamoud River And Magadini river. Enjoy a guided bike ride to this village in the morning. Later today, transfer to Lake Eyasi for overnight. 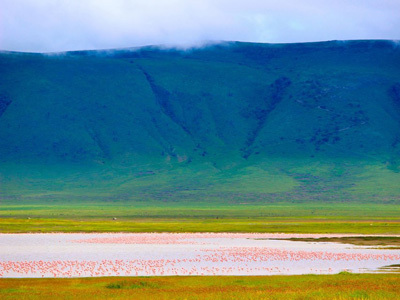 Lake Eyasi is a scenic region located along the Rift Valley escarpment, south of the Ngorongoro Crater. Due to limited fresh water resources, the region does not attract large game populations. Eyasi instead attracts those looking to get off the beaten track who desire a unique cultural interaction experience. 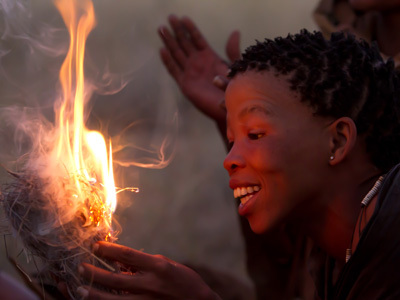 Here you have the opportunity to immerse yourself into the daily lives of the indigenous Hadzabe bushman and the nomadic Datoga tribe. In fact this is the only place in Africa where you can go hunting with these Hadzabe, the last known tribe that lives by hunting and gathering honey and fruit. This afternoon, game drive your way up into the Crater Highlands for an afternoon of resting and swimming at your lodge. 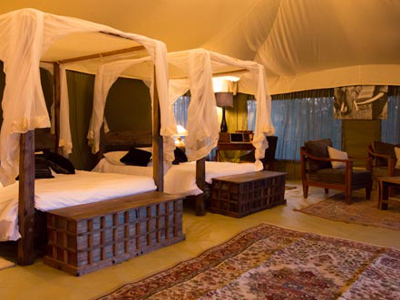 The Acacia Farm Lodge offers a variety of activities on property to keep the family happy. Enjoy an early morning bird and butterfly walk around the lodge grounds before breakfast. Mid-morning, the family can partake in bow and arrow lessons on the lodge's lawn. 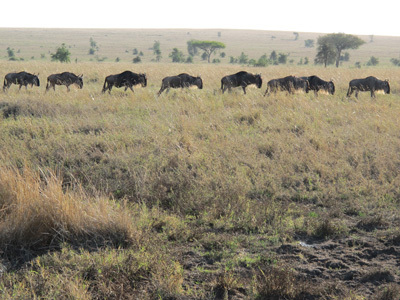 This afternoon, you will transfer to the central zone of Serengeti National Park. Enjoy a full day of game driving and exploration. Lions, zebras, cheetahs, giraffes, various gazelles, elands, impalas and warthogs among other animals dwell in high populations within the Serengeti. This is what makes the Serengeti one of the most amazing wildlife observation destinations in the world! Today you'll game drive to the Northern Serengeti. 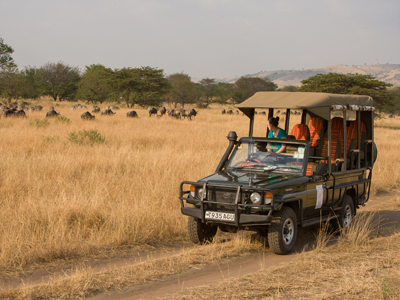 Spend the day game driving in the Northern Serengeti. If you're lucky you might even get to see the scores of zebra and wildebeest attempting to cross the Mara River. 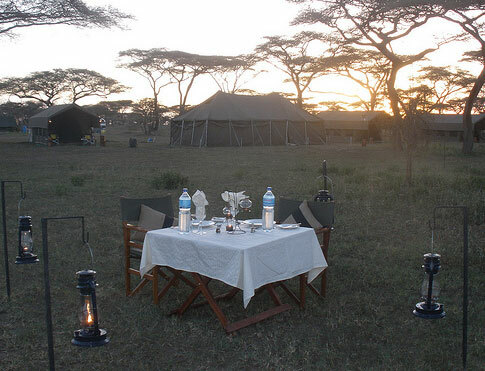 Spend your morning and afternoon wildlife viewing as the sun rises and falls over the endless plains of the Serengeti. This morning, bid goodbye to your safari guides as you are transferred to a local airstrip in the National Park. Here you will board a charter flight to Zanzibar Island. 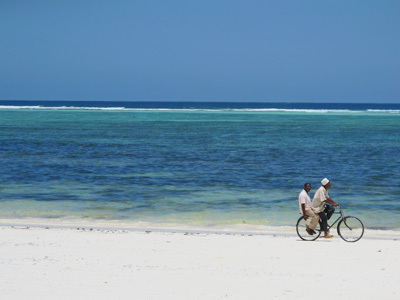 Arriving in Stone Town, Zanzibar, you will be met locally and transferred to the northern tip of the island. Zanzibar is a tropical oasis located just 25 miles off the coast of Tanzania and is the perfect pre or post-safari beach getaway. 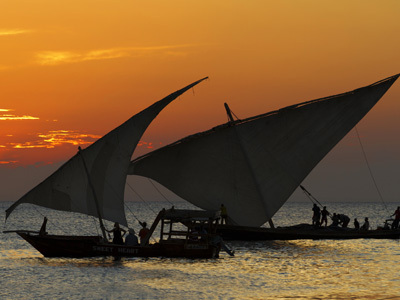 Both the birthplace of the Swahili language and home to the only ancient East African city that still functions today, this Indian Ocean “spice” island weaves breathtaking sunsets, diverse cultures and beautiful beaches into a uniquely African tapestry. This morning you will be transferred back across Zanzibar to board your flight to Dar Es Salaam. Connect here for your international flights home. 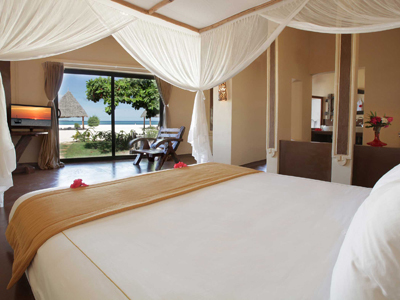 The 5-star Gold Zanzibar is a luxury beach resort set on a secluded spot of this incredible tropical island. Located on the fine white sandy beach of Kendwa, on the Northwest coast, this deluxe hotel boasts fabulous rooms, suites and individually decorated villas, real lavish retreats. 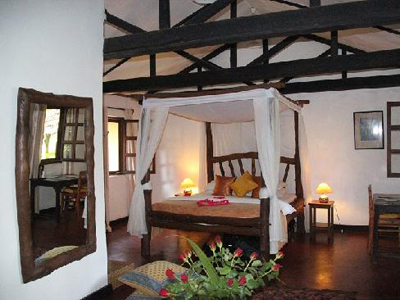 All are provided with a terrace overlooking the Indian Ocean or the lush garden.